Networking helps you to build your business. Networking focuses on building relationships and connections that can enrich your life personally and professionally. The time and effort you invest will help generate business, provide knowledge, and opportunity to learn from the experience of others. The fact of the matter is that your network is often described as your "net-worth". That is Why it matters. The Inaugural YTM Awards Dinner was held in 2016 with the focus on "WHY" ...why do you do what you do". Six speakers stepped out of their comfort zone and presented their individual responses to "WHY" they do what they do. Reflecting on their various motivators, got conversation flowing and challenged our thinking as to how we would respond. Stephen Read, Stephen Read Landscape Design told us: "A well designed garden will achieve health and wealth outcomes for the clients". His clients are interested in how are they going to use the space and how the garden is going to add to their family's lifestyle. Andrew Wilson's, Beacon Solar explained his "Why": "I'm working towards a better climate for the planet and leaving a better place for my children and grandchildren". Angela Sorpreso, Bellartista Designs provides "... opportunities for people to come into a space and just unleash their creative person within them. That is my Why." Simon Holt's, Visual Culture told us his "WHY":.. related to “video for business, a great tool for communication”. Our winner, Rody Bajo :Why do I do what I do? "I do it because I believe we live in a very noisy world. We are bombarded by tens of thousands of messages every single day, online and offline”. And Ronen Atzmon, Atzmon & Co Solicitors shared "... because I'm married with three kids and a dog, and I love the life balance. When I left the corporate section and joined private, when I left the private firm, I thought again, What should I do? Should I go back into the rat race or should I establish my own firm? When established my own firm it means I've got life balance, spend time with the family, spend time with the clients and help you grow." So Why value networking? This is my Why: Because it is through helping and supporting others we can live a full and productive life and make a difference to others. It can give purpose to our life as we help others achieve their goals. The second year, the YTM Awards speakers focussed on "WHY NOT". It was their brief to reflect on innovation in their particular field and the diverse responses from a book keeper, mortgage broker, commercial lawyer and a Business Hub creator, once again provided food for thought and the dinner conversation flowed easily. YTM provides three different formats of events to keep networking fresh and interesting. There is no pressure to provide referrals, no set agenda, no single category because YTM is based on transforming your business through conversations, knowledge and opportunities that arise from strong relationships. We believe you do business with those you know, like and trust and it takes time to establish these relationships so we provide an environment that enriches your life, personally and professionally as these relationships grow. 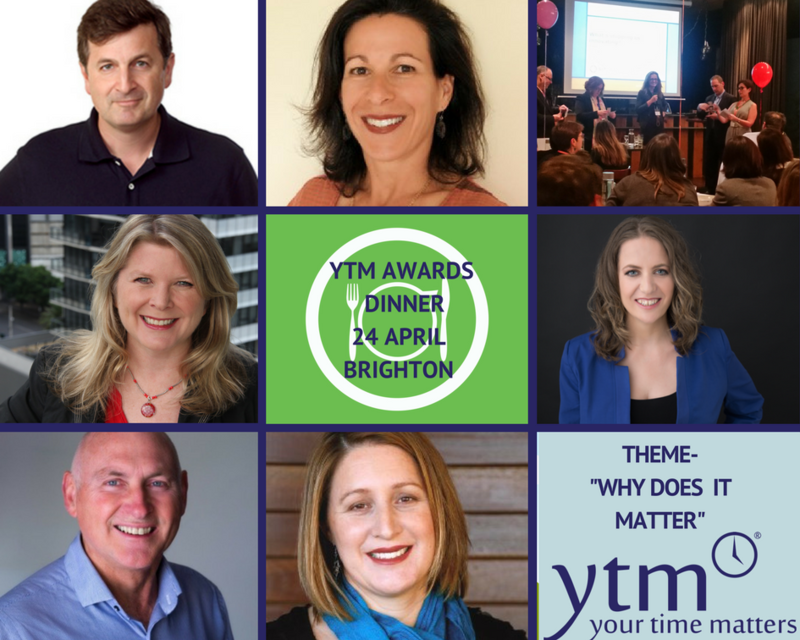 In a few short weeks, the 3rd YTM Award Dinner is scheduled with 6 speakers sharing their stories on "WHY DOES IT MATTER". Once again diverse experience and knowledge will be shared. Melinda Samson, Click -Winning Content - "Google Analytics: Why Does It Matter?" Each speaker will make a 5 minute presentation on their chosen topic to the Dinner attendees and judged on their ability to meet the criteria and convince the audience. There is also a People's Choice Award. The YTM Awards are designed to stimulate thinking, challenge your ideas and enrich your life, personally and professionally. The conversations that result from these events are inspiring and fun! The structure of the event allows for a comfortable and fun, investment of time that prompts thinking and encourages reflection. If you are going to invest in networking as an opportunity to grow and transform your business then decide on your real intent for choosing the events you attend. and, plan to achieve a real return on your networking time.